My good friend Jennie and I have decided to come clean, and reveal our secret pork tamale ingredient at last. What is it? Well, we’ll get to that. As it happened, the first time we made tamales together — aka the first time either of us had attempted tamales, period — I forgot to pick up lard at La Palma Mexicatessen (an awesome place recommended to me by Vijay from NoshOnIt). Determined not to enter another store, I scrounged through my cabinets and fridge and found a solution: the jar of bacon grease I keep in the freezer and a tub of non-hydrogenated shortening. Traditional? Nope. A great substitution? You bet! We tried out a couple different ratios of shortening to bacon grease that day, and both fell in love with the 50-50 blend with a pork filling. You get just a touch of smokiness and a mere bacon essence in each bite, the flavor playing ever so well with a saucy braised pork filling. So good. Speaking of the filling, this one’s a keeper. The braised pork shoulder is a fusion of a couple favorite recipes on the site: carnitas and al pastor. It’s hard not to eat all of the crackly bits on the top when it comes out of the oven! Shredded and mixed with a very easy to make, yet very tasty salsa roja — psst, the sauce gets a flavor boost from reserved braising liquid — the filling stays incredibly moist, even when reheated! 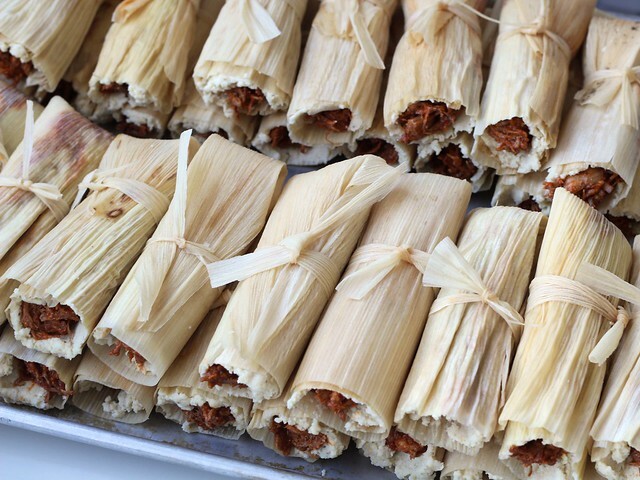 Gather up some friends or go it alone and have fun making — and eating — these tasty homemade tamales! 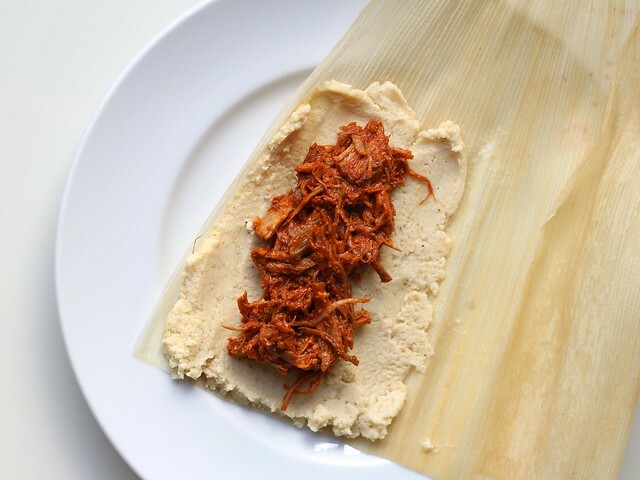 Ok, so tamales have a well-deserved reputation as being totally time consuming. To make things more manageable, I STRONGLY recommend braising the pork the day before you plan on assembling the tamales. Otherwise, you’ll have a day that starts very early in the morning and ends late at night. To mix things up, from time to time I like to serve the tamales with tomatillo salsa (or salsa verde) in place of the roja — Frontera, available at Target, Whole Foods and Cost Plus World Market, is my go-to. In a 1-gallon zip-top bag, combine chipotle through cumin; squish bag until mixed. Add pork and shake/squish until it’s evenly coated. Seal bag and refrigerate for at least 2 hours or up to 1 day. Remove pork from fridge about 30 minutes before braising and preheat the oven to 325°F. Place marinated pork in a small (2 – 3-quart) Dutch oven. Sprinkle smashed garlic over pork and pour water down the sides of the pan. Cover pan with lid and place in the preheated oven. Braise for 3 hours or until very tender. Discard garlic and remove pork pieces to a large, heatproof dish to cool. Strain braising liquid through a mesh sieve, separate and discard fat, and reserve 1 cup of the liquid (if needed, add water to make 1 cup). Once pork is cooled to room temp, shred with hands or two forks; cover and refrigerate until ready to use. 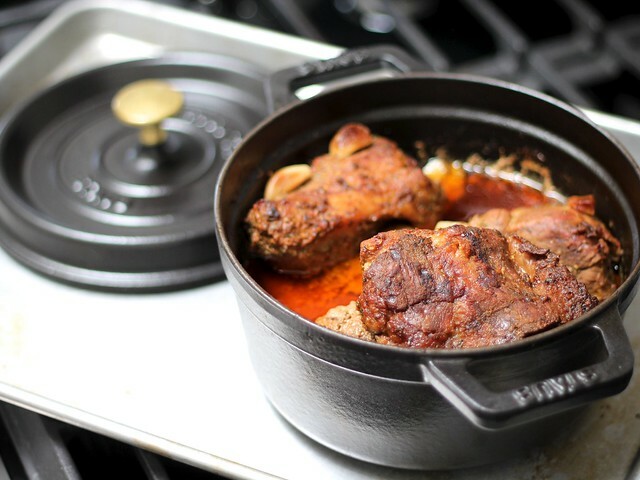 DO AHEAD: Meat can be braised several days in advance — I highly recommend doing so!! In a medium pan (4-quart) combine chiles, water, reserved braising liquid, tomatoes, cumin and salt. Set over high heat and bring to a boil. Reduce to low and simmer for about 30 minutes or until the ingredients are soft. Transfer the mixture to a blender or food processor (if the mixture is still warm, the top cannot be completely covered unless you want an explosion to occur — I just hold several layers of floursack towel over the small, center hole). Blend until smooth; set aside. Add the masa and continue to blend until thick. If needed, add water to make 5 cups sauce. Season to taste. Mix shredded pork with 2 cups (454 grams or 16 ounces) of the sauce. Set remaining sauce aside to serve with tamales. DO AHEAD: Sauce can be made several days in advance, but only after the pork is braised (you need the reserved cooking liquid). Toss with pork as instructed, and store remaining sauce in a separate container. In a stand mixer fitted with the paddle attachment, combine bacon grease and shortening. Beat on medium speed for about 2 minutes, or until evenly mixed and somewhat lightened. 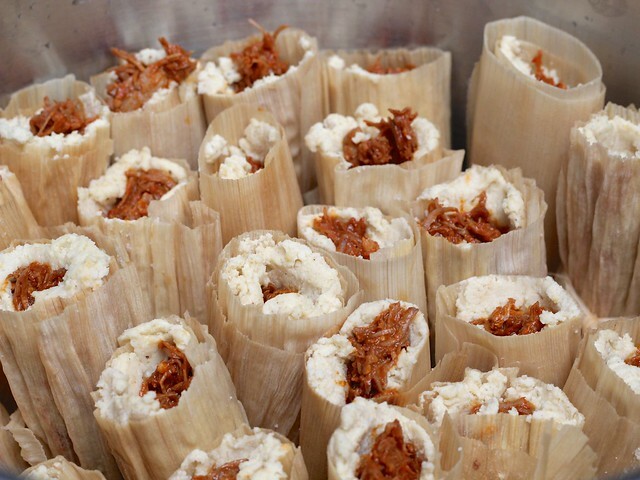 Scrape down bowl and add tamal and baking powder. Set on low speed to start (increase to medium over time), and mix until it resembles coarse sand. With mixer running, slowly pour in warm broth and water — scraping down bowl as needed — until evenly mixed. Keep bowl covered with a moist towel to help prevent it from drying out. Remove softened corn husk from water, pat dry. Spread about 1/4 cup (57 grams or 2 ounces) of dough into a rectangular shape (about 4″x6″ and 1/4″ thick) to the edges of the wider end. 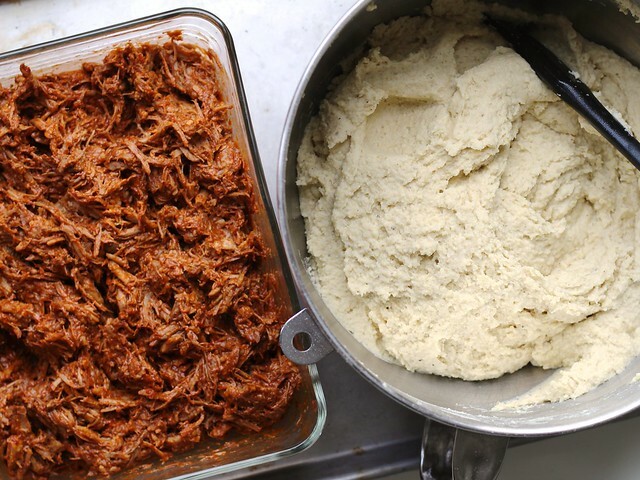 In a strip in the center of the dough (running the length), top with a scant 3 tablespoons meat (for precise weight per tamale, weigh shredded pork and sauce mixture and divide by 36). Arrange tamales in a pot fitted with a steamer basket (I use a 16-quart pot which just manages to fit the entire batch). Cover, bring water to a boil, then steam for about 45 minutes – 1 hour (you may need to carefully add more water if it boils away) or until done — the dough will easily and cleanly release from the corn husk. Warm remaining salsa roja, and spoon over tamales once removed from husks. 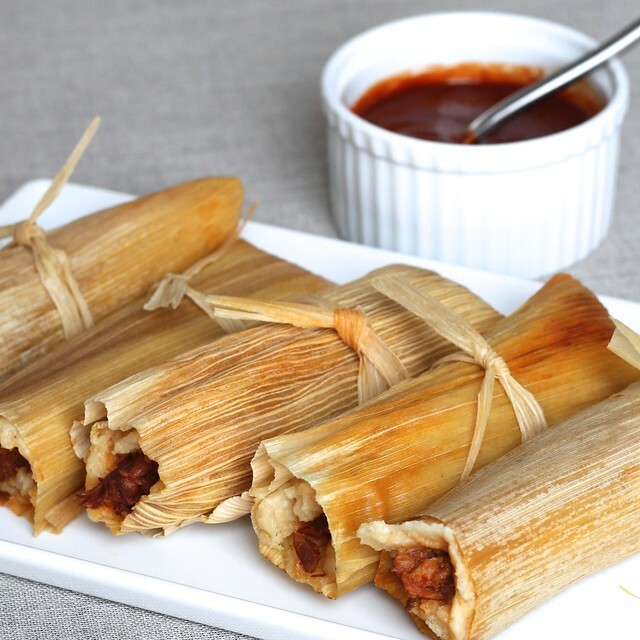 Once steamed, cool tamales to room temperature and package in freezer bags. Freeze remaining salsa roja in small portions, this makes it easy to divvy it as needed later on. 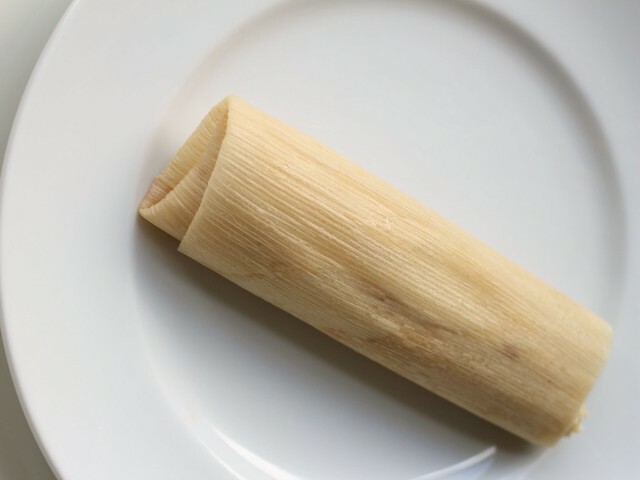 Tamales keep well frozen for months. To reheat, place steamer basket in saucepan, fill with water until it’s just below the bottom of the basket. Add tamales (straight from the freezer), cover and place over high heat. Set timer for about 15 – 20 minutes, and cook until piping hot. While tamales steam, warm salsa roja in a skillet or pot on the stovetop OR serve with your choice of salsa (Frontera green salsa is really good with them). ¹ Soak pepper in boiling water for about 30 minutes to rehydrate (you may need to weight pepper down with a spoon to keep it from floating). Can you use lard instead of bacon grease and shortening? I haven’t tried it personally, but would imagine a cup for cup swap would yield just as tender tamales! lard is what i use and have always used. they sale it in big buckets in the mexican stores around me. you can either get the grease that is clean in a green and white bucket i believe or get the cooked and used grease that has lots of flavor in it from near the meat area usually. it is what is use and usually has a brown color to it. Hi! I’m working on a Cinco De Mayo recipe roundup and came across this recipe. Would you be interested in being listed with a link to your site and this recipe? I would include a picture from this post along with the links. Thank you! Oh yes! i would love the recipe! I am a beginner at tamales! Looking for great recipes!